Polly Iyer is a name I'd never heard until I saw the book cover for Murder Deja Vu, which grabbed my attention completely. I read the synopsis and knew it was a book I'd have to read. Surpassing reviews left on Goodreads and Amazon, I've decided to share my thoughts with you in a full length review. Hint: I do that with books which give me that little extra something, books which stand out above the pack. 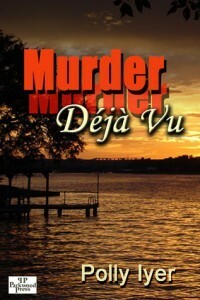 In Murder Deja Vu, I was introduced to Reece Daughtry and Dana Minette, two lead characters which piqued my interest from their first conversation. Having been accused of murder and serving a 15 year sentence, Reece Daughtry had been released from prison (six years earlier) and determined to start life anew, in a new location with the intention of largely keeping to himself. After dealing with prisoners for numerous years - serving time for a crime he didn't commit - the last thing he wanted was to live a high profile existence. If he could've blended into the shadows he would've been glad to do so but, such as it was, he did have to go out and about sometimes and people got to know his character without the stain of his past following his every move. Reece Daughtry had exceptional skill as an architect, especially designing fireplaces, crafting them brick by brick so they blended with the theme of a room. A politician, Robert Minette, approached him about having a fireplace designed but Reece refused outright. When Dana Minette (Robert's ex) came knocking on Reece's proverbial door, he decided to check out her place and agreed to take on the job. This is the beginning of Murder Deja Vu and sets the stage for so many things to follow, largely because of a man who refused to let go of his ex, a man who continued to think she would come to her senses. However, something else was happening behind the scenes: the investigator of the lawyer who had been working on Reece's behalf was "back home" asking questions. When another murder occurred in the town where Reece Daughtry had moved after getting out of prison, the MO looked the same and Reece became the prime suspect. Having no intention of being thrown in prison again, he decided to seek his own answers but, to his surprise, Dana refused to stay behind. Should he argue and risk the cops catching up with him or give in and put as much distance between them and the town they'd come to call home? The story was intriguing and I must admit there were a few surprises along the way. I kept changing my mind as to who the murderer was and learned there were more prisoners of blackmail than I would ever have expected. As much as I enjoyed the unfolding story - keeping me turning pages rapidly until the end - I enjoyed getting to know Reece and Dana most of all. The feelings which developed between them, not to mention their loyalty and protectiveness toward each other, was beautiful to witness. The unwavering trust they shared was something to covet and I kept hoping they would elude the authorities so that Reece could prove that he had, indeed, been innocent of both murders. If you would like to learn more about Murder Deja Vu, please click the book cover which will take you to its page on Amazon.